This medication is used to treat conditions including swelling (inflammation) of the eyes and to treat or prevent bacterial eye infections. This product consists of tobramycin, an antibiotic that works by stopping the development of bacteria. It likewise consists of loteprednol, an anti-inflammatory corticosteroid that works by decreasing swelling, soreness, and itching. 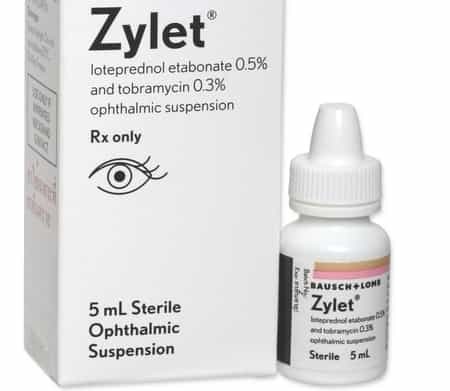 ZYLET (loteprednol etabonate 0.5% and tobramycin 0.3% ophthalmic suspension) is a topical anti‑infective and corticosteroid mix for steroid-responsive inflammatory ocular conditions for which a corticosteroid is shown and where shallow bacterial ocular infection or a risk of bacterial ocular infection exists. Ocular steroids are suggested in inflammatory conditions of the palpebral and bulbar conjunctiva, cornea and anterior segment of the world such as allergic conjunctivitis, acne rosacea, shallow punctate keratitis, herpes zoster keratitis, iritis, cyclitis, and where the inherent risk of steroid use in certain infective conjunctivitides is accepted to obtain a diminution in edema and inflammation. They are likewise suggested in chronic anterior uveitis and corneal injury from chemical, radiation or thermal burns, or penetration of foreign bodies. This medication is applied to the eye(s) as directed by your doctor. To apply eye drops, wash your hands first. To avoid contamination, do not touch the dropper pointer or let it touch your eye or other surface. Shake the bottle well prior to each dosage. Using a combination drug with an anti-infective part is indicated where the risk of superficial ocular infection is high or where there is an expectation that potentially dangerous numbers of bacteria will exist in the eye. The particular anti-infective drug in this item (tobramycin) is active versus the following common bacterial eye pathogens: Staphylococci, including S. aureus and S. epidermidis (coagulase-positive and coagulase-negative), including penicillin-resistant strains. Streptococci, consisting of some of the Group A-beta-hemolytic types, some nonhemolytic species, and some Streptococcus pneumoniae, Pseudomonas aeruginosa, Escherichia coli, Klebsiella pneumoniae, Enterobacter aerogenes, Proteus mirabilis, Morganella morganii, most Proteus vulgaris pressures, Haemophilus influenzae, and H. aegyptius, Moraxella lacunata, Acinetobacter calcoaceticus and some Neisseria types. Efficacy to treat a wide range of ocular inflammatory conditions that have a risk of infection. A mix solution to help provide relief. Developed safety profile with low incidence of IOP elevation ≥ 10 mm Hg3. If ZYLET is used for 10 days or longer, IOP must be kept an eye on. Readily available in 5-mL and 10-mL bottle sizes. Prolonged use of corticosteroids might lead to glaucoma with damage to the optic nerve, and defects in visual acuity and fields of vision. Steroids should be used with caution in the presence of glaucoma. If this product is used for 10 days or longer, intraocular pressure ought to be monitored. Use of corticosteroids might result in posterior subcapsular cataract formation. Using steroids after cataract surgery might delay healing and increase the occurrence of bleb development. In those diseases causing thinning of the cornea or sclera, perforations have been understood to occur with the use of topical steroids. The preliminary prescription and renewal of the medication order need to be made by a doctor just after examination of the patient with the aid of magnification such as a slit light biomicroscopy and, where appropriate, fluorescein staining. Prolonged use of corticosteroids might suppress the host response and hence increase the danger of secondary ocular infections. In intense purulent conditions, steroids may mask infection or enhance existing infections. If symptoms and signs cannot improve after 2 days, the patient ought to be re-evaluated. Employment of corticosteroid medication in the treatment of patients with a history of herpes simplex needs fantastic care. Use of ocular steroids may extend the course and worsen the severity of lots of viral infections of the eye (including herpes simplex). Fungal infections of the cornea are especially susceptible to develop coincidentally with long-lasting, local steroid application. Fungus invasion must be thought about in any persistent corneal ulcer where a steroid has been used or is in use. Most typical unfavorable responses reported in patients were injection and superficial punctate keratitis, increased intraocular pressure, and burning and stinging upon instillation.